Savannah F6 SBT Kittens available, born on 2019/03/23, 1 boy and 3 girls. First of all, take a good look at a Savannah kitten! Well-bred Savannahs that meet the breed standard are not cheap. Make sure that if you want to purchase a Savannah kitten, it complies with the RACE STANDARD, as described in the breed description of TICA. Recognized colors are Black (Brown) Tabby Spotted, Black Smoke and Black. We breed according to the RACE STANDARD of TICA. There are many Savannahs for sale with unauthorized colors or they are not pure! Unrecognized colors are: Snow, Blue or something similar! Avoid regretting your purchase! Cheap Savannahs do not exist, in most cases you buy a cat in the bag. Our kittens leave us with an European passport, chipped, fully vaccinated, dewormed, pedigree (or pedigree certificate) and certificate of ownership. We are affiliated with the American cat club TICA and breed according to their standard. If it turns out that you are interested in one of our Savannah kittens, you can reserve a kitten. A deposit is required upon booking. The deposit can be paid at the first viewing of the kitten. It is possible to schedule a viewing from the moment the kittens are 5 to 6 weeks old. 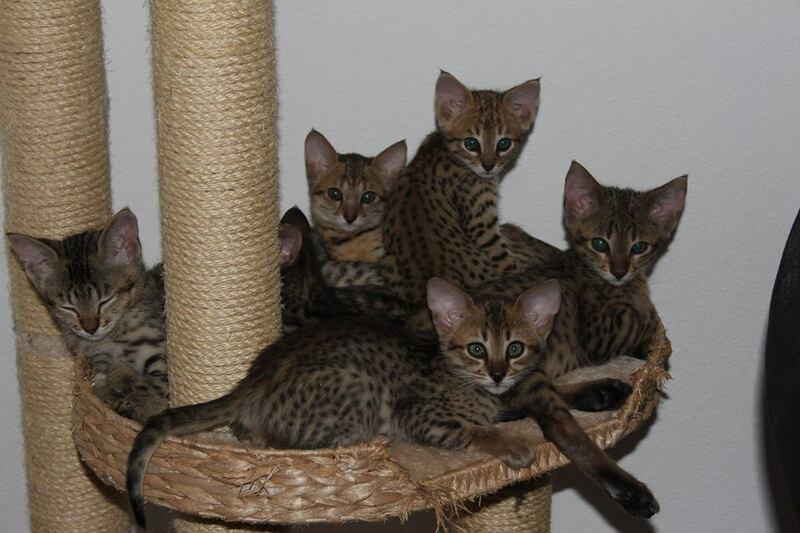 The Savannah Kittens came to us from a pure Savannah – Savannah combination. This means that the Savannah Kittens have all the character traits of a Savannah cat! Savannah Kittens, with a lot of mishmash (often private individuals), have these properties less or hardly, and they also have a higher risk of hereditary diseases, which Savannah does not have. When finding a kitten, pay close attention to whether the father or the mother of the kitten is not used. In most cases, it is bread breeders who do this. The more offspring there are, the less attractive the pedigree is, the cheaper the kittens are offered. There is a big difference between multiplying the breed and adding something to the breed.